NVIDIA’s flagship GTX 1080 Ti has been limited to large, mid-full tower configurations up until now but with the introduction of ZOTAC’s GTX 1080 Ti MINI, things are about to change. The condensed dimensions to which MINI has been engineered to make it the ideal graphics card for those building inside a small form factor enclosure. System builders with the objective of utilising a compact Mini-ITX set up have, been restricted to GPUs like the 1050, 1060, 1070 but now even such a platform can reap the benefits of NVIDIA’s high-performance offering. As things stand (at the time of writing this article) ZOTAC has the only GTX 1080 Ti which can be used in such a setting – enabling them to lay hold on the claim of the world’s smallest GTX 1080 Ti. A position which will no doubt allow them to monopolize – at least for the moment! 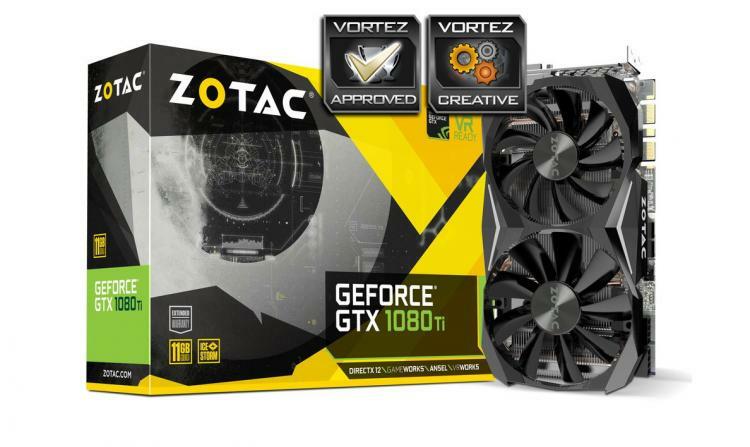 ZOTAC has recently performed a revamp on their graphics cards by moving away from the signature yellow theme and instead, have opted for a neutral livery on all of the options available. MINI therefore uses a gunmetal finish; which will suit a large majority of users. The idea behind this rebrand is to appeal to a wider audience rather than causing potential buyers to go elsewhere, which is what specific-coloured hardware can cause. As can be expected from a GTX 1080 Ti, the MINI presents us with excellent performance regardless of the title or resolution. ZOTAC has applied a minor factory overclock to the GPU core which isn’t particularly exciting but it still manages to push the card beyond the Founders Edition. If users are happy to indulge in a bit of manual overclocking themselves, MINI can be pushed further – we managed to modify the GPU clock speed to realise a 10% increase and the memory clock a 5% increase. Again, a greater overclock to both these attributes will allow users to tap into even better performance in 3D environments. Our overall experience with this graphics card was positive but there are a few areas of concern which should be highlighted. Due to the footprint, ZOTAC has obviously had a rather tough and challenging time creating a heatsink which is capable of handling the heat generated from the GPU (GP102) and other components. The Arctic Storm cooler which sits on MINI isn’t able to deliver the same results that larger counterparts offer. Temperatures will hit around 80 degrees after 30 minutes of gaming with the fans set to “auto” – at this temperature the fan speed sat around 50% and the fans spin at 1500RPM, and going beyond this will inevitably create more noise. At a cost of £689 GBP / $800 USD, this might not be the fastest or coolest GTX 1080 Ti but it certainly is the smallest and as our MINI is backed by a huge 5 years’ warranty – it’s a great option if you’re a gamer who sees Mini-ITX as the only pathway. MINI might be the world’s smallest GTX 1080 Ti but it breaks convention by delivering big performance. ZOTAC has indeed beaten rival NVIDIA partners to it and this graphics card will be very popular among small form factor advocates.